1. Where is Walton's Grizzly Lodge? We are located 45 minutes from Reno and one hour from Truckee. 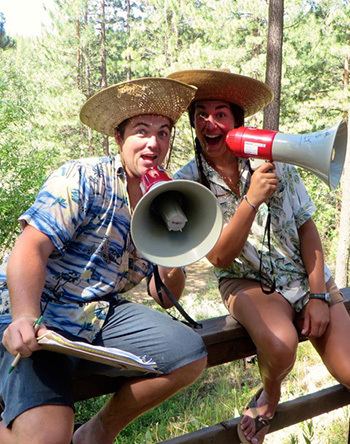 The mailing address for camp is: PO Box 519, Portola, CA 96122. Our physical address is: 5390 Ice Pond Road, Portola, CA 96122. 2. How many campers attend each session? Our one week sessions have 150 campers. Our two week sessions have 175 campers. 3. What is the ratio of campers to staff? Approximately five to one. 4. What is the average return rate for campers? Between 60-70% of our campers each summer have been campers with us previously. 5. What is the average return rate for staff? Between 50-60% of our staff each summer have worked with us previously. 6. Where do your counselors come from? Many of our counselors have been campers with us. The majority attend west coast colleges, but we have staff from across the country. 7. What is the age range of your staff? Our counselors must be at least 18 years old, and have completed a minimum of one year of college. The typical age range each summer is 18-25 years old. Our Specialists and Assistant Directors are typically between the ages of 22-30. 8. How many campers are in each cabin group? Each group has eight campers. Cabins (buildings) house 1 - 3 groups and their counselors. 9. How do campers get to Walton's Grizzly Lodge? The majority of our campers are driven to camp. We also pick up campers who fly into the Reno Airport and bring them to camp. 10. How do campers select their activities? Campers choose from among 40 activities each day. Campers choose two activities in the morning, two in the afternoon and one in the evening. 11. What is the weather like? Typical day time temperatures range from 75-85 degrees. Typical night time temperatures range from 45-55 degrees. 12. Do you have a nurse on duty? We have two nurses on staff. 13. What level of medical care are you able to provide for campers with special medical needs? Walton's Grizzly Lodge has two nurses on staff in our Health Center. Please call our office to dicuss your campers specific needs and we will be able to determine if our camp is a suitable environment for your camper. 14. Does the camp have a religious affiliation? No, Walton's Grizzly Lodge does not have a religious affiliation. We have kept a few traditions that were started by Mom and Pop generations ago. Mom named one of the meeting places in camp, "The Church in the Wildwood" and Mom and Pop began each meal with a grace, "Before we eat, we bow our heads and give thanks for our daily breads." On Opening Day, we explain these traditions as part of our history and that they are not meant in a religous context. Please call or email. We would love to hear from you.